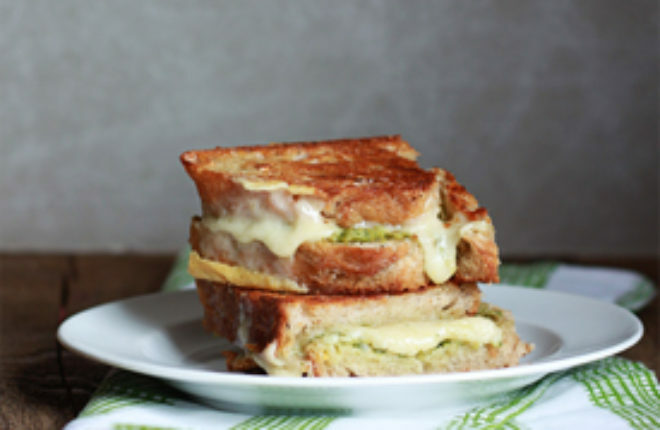 Creamy artichoke-arugula pesto and sharp cheddar melt together deliciously in this simple – but simply divine – grilled cheese sandwich. Add a little grilled chicken or cooked bacon to the meat-eaters’ sandwiches, and everyone’s happy! Welcome to pure unadulterated cheesiness. Pure unadulterated deliciousness. Pure unadulterated awesomeness. I’m realizing I actually have no idea what “adulterated” means. I hope it doesn’t mean gross, because now I’m committed. 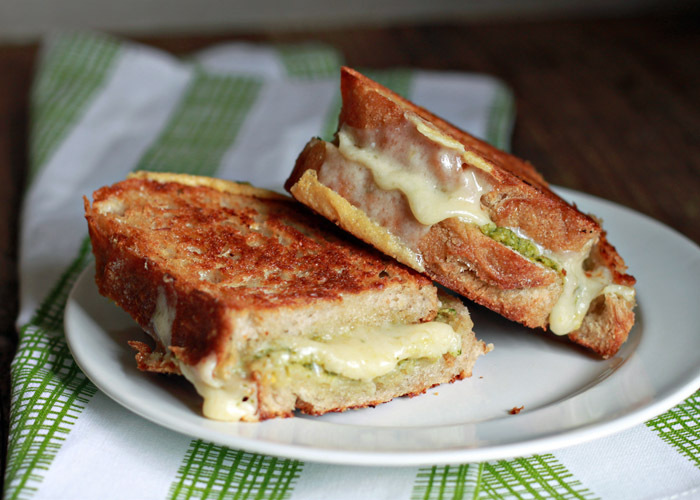 Here, my friends, I offer you an Artichoke Arugula Pesto Grilled Cheese. Pure unadulterated, um, lunch. I love a good grilled cheese. Which, incidentally, I typically don’t call “grilled cheese.” In our house, it’s called toasted cheese, but when in Rome … or when writing a food blog … you do as the Romans/bloggers do. And pretty much everyone else. So “grilled cheese” it is. At least in print. 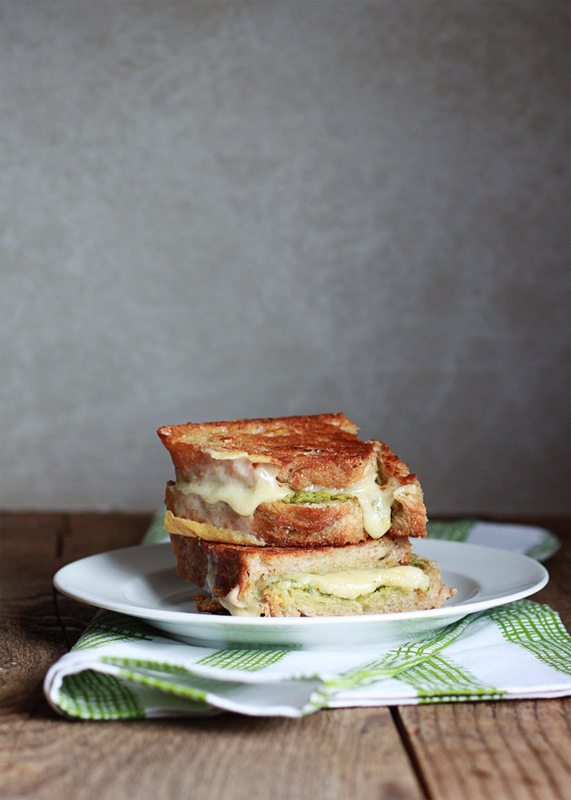 This Artichoke Arugula Pesto Grilled Cheese was inspired by an incredible sandwich that I’ve enjoyed for years at one of my favorite restaurants. It’s a smoked mozzarella sandwich slathered with pesto and topped with tomatoes. It’s perfection. They’ve recently removed it from the menu (WHAT) but, so far, they’re still willing to make it for me when I ask. So that’s cool. But I wanted to make something similar at home. And I wanted it to have artichoke hearts. And arugula. And cheddar instead of mozzarella. Really, I suppose the only similarity is that this, too, is a grilled cheese with pesto. Allow me to daydream for a minute, here. 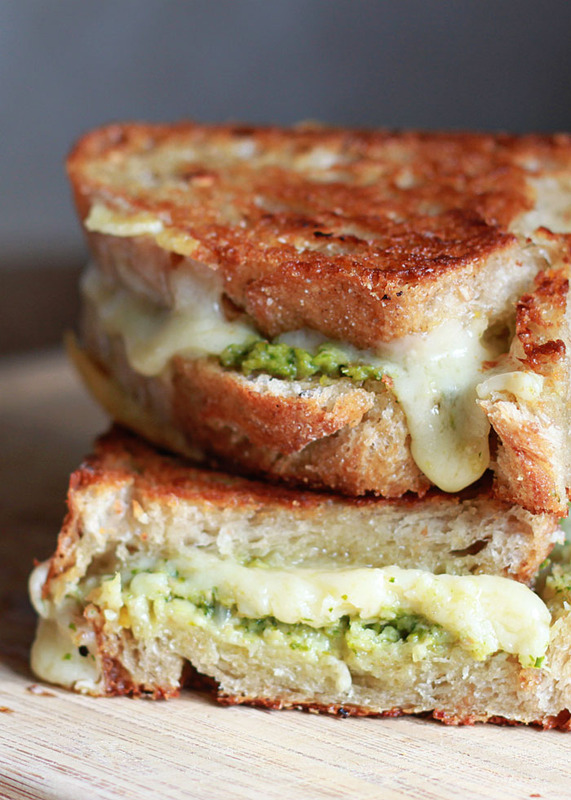 Pesto on grilled cheese is a very, very good thing. The pesto gets all warm and melty, its intense green goodness simultaneously infiltrating the bread and mingling with glorious melted cheese. This particular version features a super-addicting pesto made with arugula, artichoke hearts, walnuts, and lemon. When combined with golden buttered bread and salty-sharp cheddar cheese, the result is heaven. Make the pesto. In a food processor, pulse together the baby arugula, artichoke hearts, garlic, walnuts, Parmesan, zest, lemon juice, and salt until the texture resembles a very coarse meal. While the food processor is running, slowly drizzle in the olive oil until the mixture forms a saucy, spreadable pesto (you may need a little less or a little more olive oil). Make the sandwiches. Butter the outsides of each slice of bread and lay buttered side down. Spread 2 tablespoons pesto on the inside of each slice. Lay cheese on two of the slices and cover each with the second slice of bread, pesto side down and buttered side up. Heat an electric griddle or large frying pan over medium-low heat. Carefully transfer sandwiches to cooking surface and cook, pressing occasionally with the back of a spatula, until golden brown. Flip and cook the other side, pressing occasionally, until browned. Turn the sandwich back over and continue cooking, turning occasionally, until the cheese has completely melted, about 5 more minutes. Chipotle Butternut Squash & Pepper Jack Grilled Cheese – spicy! 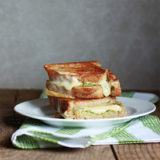 I can’t think of a more perfect lunch for a rainy day like today than this artichoke pesto grilled cheese! That melty gooey cheese is singing a serious love song to my belly and soul! WANT! LOVE the idea of an arugula/artichoke pesto. I’ve been missing pesto lately, and the basil at my local market always look so limp and sad. We are a toasted cheese family too 🙂 Or just simply ‘toastie’. Pesto on a toasted cheese is a very very good thing. The flavour from the heated oil and herbs infuses the bread and paired with the salty fatty cheese and briny artichokes. MAN this looks good! I love a good gourmet grilled cheese sandwich! I’ve made arugula pesto for pasta but have never thought to use it on a sandwich, great idea. Pingback: 5 Recipes that Actually Make me Want to Cook… | the happy go lucky.